The event was moderated by Mr. J. David Whaley, former UN Resident Coordinator in the African region. 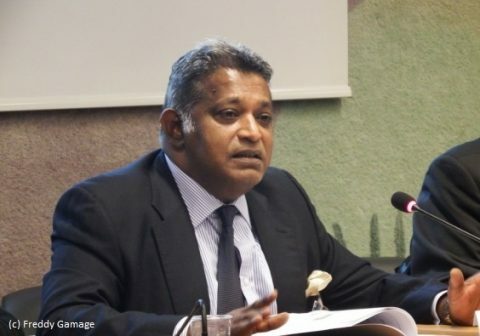 Former Secretary of the Consultation Task Force of Reconciliation Mechanisms (CTF), Dr. Paikiasothy Saravanamuttu, delivered a keynote speech to share his views on the final report of the CTF. Three civil society representatives from Sri Lanka, Dr. Nimalka Fernando, Ms. Saroja Sivachandran and Ms. Jensila Majeed, followed the keynote speech. In the opening of the event, Mr. Whaley noted the criticism on the slow progress in implementing the Human Rights Council resolution 30/1. Yet, he stressed that the consultation process by the CTF was a notable step. Dr. Saravanamuttu started his speech by describing the consultations as “all-island consultations” without restricting in any region or any people. There was no interference from the government. He explained the CTF’s primary objective: ascertaining the views of the public regarding the four transitional justice mechanisms in order to implement the resolution 30/1. He regretted that the Sri Lankan government did not inform the public about what was in intended in the four mechanisms, despite the request from the CTF. The CTF also requested the government to ensure no oppressive measures from the armed forces. Yet, it was not the case. The presence of members of the security forces in consultations were reported, and he also had to personally ask those members to leave the consultations. He shared from his experience that the CTF members met anger, frustrations and bitterness during the consultations due to past failed commissions. However, he witnessed much enthusiasm from the same people after the explanation about the government’s desire to engage and listen to people’s ideas about the mechanisms for the four pillars of transitional justice. The CTF received over 7,300 submissions. At the ground level, the Zonal Task Forces facilitated consultations and, the forces’ membership had at least 50% women. He further highlighted that many submissions were made by women. He spoke with regret that the government rushed the Act for the Office of Missing Persons for adoption before the September Human Rights Council though consultations were underway. He stressed the key demands from the participants in the consultations, and most of them are victims and their families. He said, “what is most important is the truth on what happened needs to be established and needs to be acknowledged by the government.” He further shared their views that amnesty should certainly not be granted for the people who gave orders for violations and crimes. Furthermore, he highlighted their demand to take part in future mechanisms that are accessible in terms of location and language. He shared the satisfactions about the process of consultations facilitated by ZTFs who were known to locals. He regretted the absence of the President and Prime Minister at the handing-over of the CTF report. Addressing the recommendations from the CTF, he described that the recommendations concerning international participation and a hybrid court attracted the most attention but were dismissed by some government officials. He stressed that the recommendation on a hybrid court was not solely based on the consultations. He reported that it was because quite a few who came before the CTF expressed the need of international and Tamil-speaking judges. He put an emphasis that the reports submitted to the CTF were published without translation to not lose some key points. At the end of his speech, he strongly stated that the government cannot ignore the 900 pages report if it is serious about unity, peace and prosperity in Sri Lanka. Before handing the floor to the panelists, Mr. Whaley requested everyone to share their constructive criticisms and perhaps one or more positive points. Next, Ms. Sivachandran provided her view on the CTF report from the perspective of the Northern tip of Jaffna. She pointed out that transitional justice is a new approach for Sri Lanka. She regretted that the government has been rushing the transitional justice process. It has resulted in the failure to increase the general public’s understanding on transitional justice. Consequently, she believed that many people could not respond due to the lack of understanding, which was similar to the civil society. She welcomed the ownership of the process of the CTF report and stressed the government’s great responsibility for it. She asked the government about the reparations and the ways government will make them happen. She regretted that the Office of Missing Persons (OMP) has not been established, and many protests in relation to enforced disappearances are taking place in the North. She questioned the government’s commitment to transitional justice. She stressed that one of the key factors for transitional justice is a hybrid court, therefore the strong campaigning by civil society to consider the CTF report for betterment of those affected is necessary. Then, Ms. Majeed explained that the CTF was effective and efficient because academics, researchers, human rights defenders, activists, and victims took part in it. Ms. Majeed was a member of the Zonal Task Force of Mullativu and told the audience that there were diverse affected members. Males and females equality participated in the process. According to her, the transitional justice process is new to the Sri Lankans, including Task Forces and victims. She pointed out the disparity between the definitions of transitional justice for Sinhalese and Tamils. While Sinhalese interpreted it to punish the war heroes, Tamils understood it to get justice. Furthermore, many participants in consultations already had a perception that the government will not give them justice due to many failed past commissions. She regretted that Muslim community’s struggles and challenges for the last 25 years have been submerged in the Tamil issues including the land re-distribution. She identified several shortcomings of the CTF process: the lack of funding for an awareness-raising for the victims as well as inadequate trainings and capacity building for the ZTF members; the short time frame for the consultation process; the adoption of the OMP Act during the consultations process created distress to the victims; the incidents of intimidation and harassment in consultations regardless of the government’s assurance; the absence of the Prime Minister and the President at the presentation of the CTF report; and the lack of recommendations for Muslims (*this point was clarified by Dr. Saravanamuttu that many of the CTF recommendations concern Muslims). She recommended the government to carry out the following: implement the CTF recommendations to win the trust from the victims; guarantee the representation of the victims in the implementation process with accesses in their own locations and language; make sure that a new Constitution guarantees the safety and security of minority women; realise justice for the Muslim community through the transitional justice process; and ensure the future safety and security of the Task Force members and the victims. Dr. Fernando reaffirmed the purpose of the event—the acknowledgement of the civil society members’ powerful role in Sri Lanka which represents multi-ethnic, multi-religious and multi-caste society, while the government was requesting 2 years-extension to implement the resolution 30/1. She remembered the great contributions of civil society members who remained home to fight for reconciliation, peace and justice in the last 10 to 15 years. According to Dr. Fernando, the report speaks about people who want to remain in Sri Lanka and to create a country that provides refuge, protection and life for their children. Moreover, the report underlines politics and democracy that bring different communities to join hands and say one day, “We are celebrating our diversity in that land”. She shared the voices of victims who struggled to come before the CTF and proposed mechanisms in order to find the truth about what happened to their family members. Although victims do not necessary understand the meaning of transitional justice, they participated in consultations and asked simple questions such as compensations for enforced disappearances. She pointed out that those responsible for enforced disappearances in the South still remain in the security forces, highlighting the culture of impunity in the country. Dr. Fernando shared a Sinhala mother’s testimony of the disappeared who once said, “If I can find at least what happened to my child, I will join Tamils who are searching their loved ones”. The mother views the transitional justice process as a process to find a path. She identified two ambitions of the unity government—constitutional reform and transitional justice mechanisms—as opportunities to address justice and to create a new Sri Lanka. She urged the government to bring the best possible court in order to give justice to victims. She stressed that the transitional justice process needs mechanisms for confidence, truth, justice, and memorialisation in a dignified manner. She shared her faith to the victims and their movements for justice in Sri Lanka, and she reminded the moral obligations for victims. She emphasized that reparations are not limited to compensation. The acknowledgement of the truth and justice are as well part of reparations. In the end of her speech, she stressed the government’s responsibilities to transitional justice including power-sharing and embracement of the country’s diversity. Before opening the floor for interactive discussions, Mr. Whaley paid tribute to the civil society members who constructively engaged with the consultation process despite the criticisms from others civil society members. 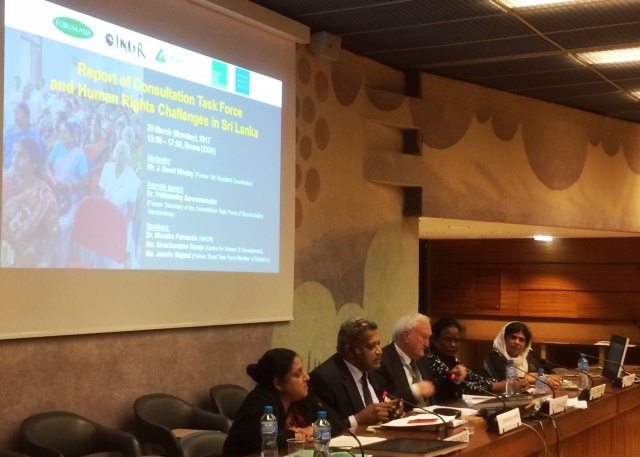 During the interactive discussions, comments and questions were raised from wide-ranging actors such as human rights defenders from Sri Lanka, diaspora persons and human rights organisations.